Description Airborne Kangaroo is a funny game in which you have to help this kangaroo to jump to the top. 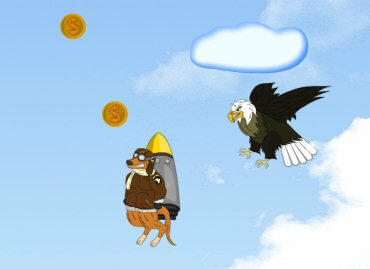 Collect coins along the way, jump from cloud to cloud. Buy upgrades to get even higher. With the collected coins you can buy more fuel or increase the value of the coins and a lot more things. If you fall you will enter the upgrade screen, spend your money and try again. Can you find out what is out there at the top? Good luck! Controls Press the left mouse button to launch it from the cannon. Then you can use your mouse to guide the Kangaroo. Avoid the birds and the thunder clouds. Click the left button to use the jet pack. I like launcher games like this!